Planning for a kayak fishing trip is always exciting. You’re anxious to get on the water and you’re dreaming of your kayak being pulled around with a big fish on the line. We’ve been there a hundred times and brought in a few of those big fish, too! However, we would have been able to land a few more if we had always packed correctly. Our team came up with a Top 11 list of items you should take on your kayak trip, as well as extra items we have always found helpful. Here is our entire checklist in a printer-friendly PDF! 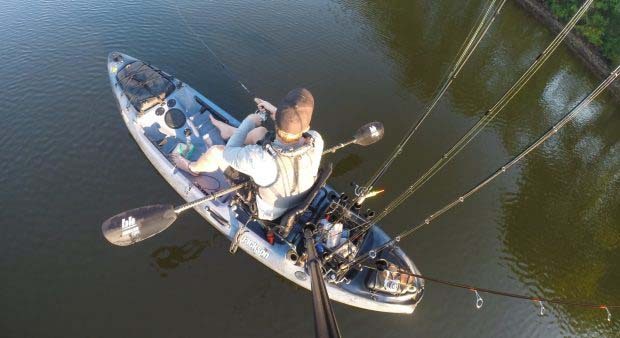 Paddle – Yes, this is the easy answer, but we dare you to take a poll of kayak fishermen to see how many of them have forgotten their paddle at home. About 50% will say they’ve forgotten the paddle, and the other 50% are lying. 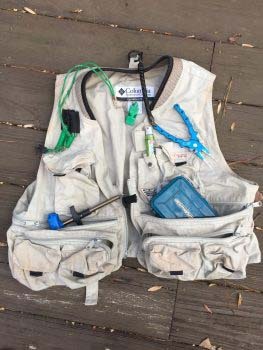 Life Jacket – Not only is this required in most states, but it’s encouraged especially when you’re kayak fishing alone. One of our experienced staffers once got himself caught in between a strong crosswind and his anchor stakeout pole and flipped over. Even though he was in a grass flat of about 4-feet of water, he was lucky to be wearing his life jacket that day. Water – Don’t underestimate how thirsty you’ll get when you set out for a day of paddling. Bring a full Nalgene for every 3 hours you’re on the water. It gets hot in the summer, and having enough water means you can stay out fishing as long as you like. Fishing Poles – This is meant to be plural, not singular. Even if you’re headed out for a quick trip, it always makes sense to be prepared for anything you might see. Rig up different kinds of lures for the different situations you’ll encounter. Maybe a topwater for the morning, a few different colored jigs for late morning and afternoon, and a live bait hook if all else fails. Knife – Having a knife easily accessible is not only handy, but it’s a necessity. 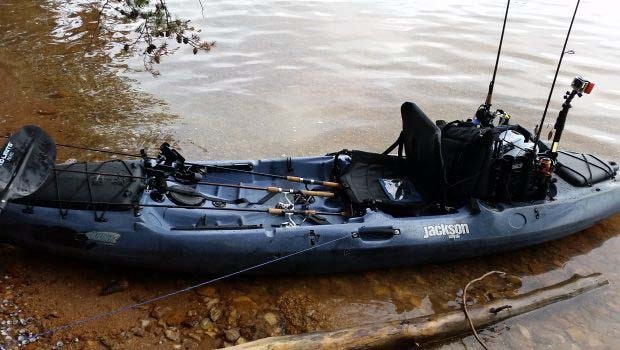 Remember when our staffer flipped in his kayak due to high winds? Having his knife easily accessible made it easy to cut the anchor line that got wrapped around his legs when he flipped. He was able to calmly climb back into his kayak and not have to worry about drowning. Not to mention you can use a knife to switch lures, cut bait. Anchor (and anchor line) – Wind plays a big factor when you’re on the water in a kayak. If you find a good spot you can quickly find yourself 10 yards out of casting distance before you even cast a second time. 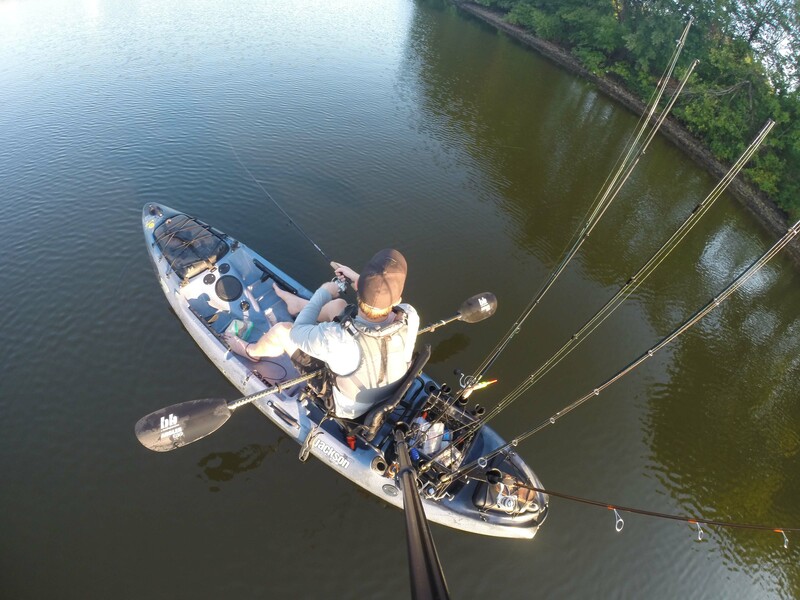 A 3lb grappling kayak anchor should hold almost any kayak, or look to invest in a kayak anchor pole if you’re consistently in shallow water. Planting an anchor pole is much faster than pulling an anchor rope in and out. Wading Boots – Really any type of water shoe works. Depending on where you launch, you never know what’s on the bottom or if you’ll want to get out and wade up to a great fishing spot. (Be careful when wading if you know alligators are around.) Also, watch out if the ground is mucky. You could easily lose a shoe. Kayak Seat – Some fishermen prefer the seat that comes with their kayak, but a good kayak seat can change your entire day of fishing. Getting all the way to your launch point and realizing you have no seat could mean a long day for your back. Sunglasses – This really should be higher up on our list, but we think all 11 of these things are necessities anyway. When you’re in a kayak the glare from the water is huge. You’ll be squinting all day and not enjoy fishing if you forget a pair of sunglasses. Whistle – We recommend the Fox 40. It can be heard up to a mile away and it’s only a couple bucks. Use it if you get lost, if a boat is coming towards you, or if a friend casts their line over yours. That’s an immediate penalty. Fishing License – It may depend on the state, but we’ve been stopped a few times out on the water by Fish and Wildlife. They’ll ask for your fishing license. Most states won’t fault you if you don’t have it on the water, but they will call it in to make sure you’re telling the truth. They usually make you wait around while they call which can cut into your fishing time. These are the essentials, but over the years we’ve learned a few tricks to make the most out of your kayak! Milk Crate – Milk crates were so well designed for kayaks it’s ridiculous. We’ll probably end up writing a post about all the things you can do with a milk crate. You can fit all kinds of things in this 12x12x10 inch cube. You can add rod holders to the outside, organize your lures in boxes on the inside, and still have room for extra knives, a cast net, drinks, snacks, you name it. Camera – You never know when that 8lb bass is going to grab your lure. You’re definitely going to want a picture so you can brag to anyone who wasn’t with you on the trip. You can use your phone, but having a waterproof camera like a GoPro is the best way to go. Extra Lures and Line – This also seems like a given, but having enough tackle to make it through a day on the water is essential. Don’t forget leader line, too! Fishing Net – You’re close enough to the water that you can usually haul the fish in with your hands, but if you have a real trophy on, you can increase your chance of landing the fish with a net. Pliers – Fishing pliers have come a long way since we started fishing more than 20 years ago. They’re really an all-in-one. The fishing line cutting tool is outstanding when quickly tying on a new lure. Just like the knife is a necessity for safety, pliers are a necessity for convenience. Dehooker – Toothy fish can ruin your day, or at least make you re-tie a line. Dehookers are small enough to fit in a milk crate or your pocket and are worth the effort. 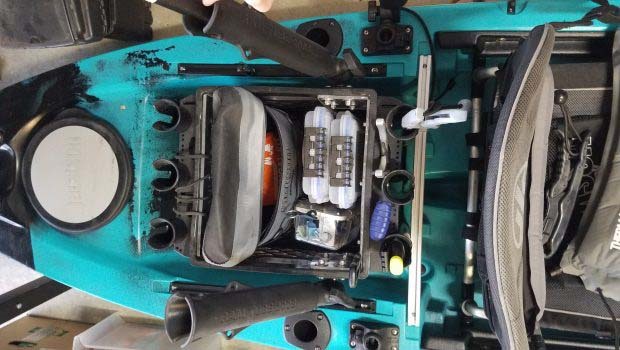 Rod Holders – Most fishing kayaks come with at least a few mounts for your rods, but don’t forget some adjustable ones, like Scotty Rod holders, come off the kayak. Don’t forget to put them back on before your trip. Ruler to Measure – If you’re interested in keeping any fish, you’ll need this ruler. Always count on a fish and wildlife warden to be back at your launch point, it’s not worth bringing back any over slot/under slot fish. First Aid Kit – Packing a pair of tweezers, a few pads of gauze, an alcohol wipe, and waterproof tape will let you clean up a cut and get on with your fishing day without having to head back to shore. There are some great waterproof premade kits out there! We wish you tight lines on your next kayak fishing trip! Be prepared so you can spend more time fishing and less time worried about what you forgot. Download our free Kayak Fishing Checklist here. We even left a few spaces blank if you think we forgot anything!